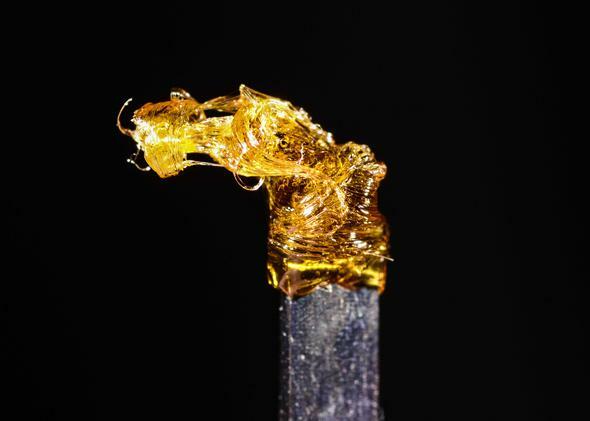 How dabbing—smoking potent hash oil—could blow up Colorado’s marijuana legalization experiment. How dabbing—smoking potent, highly processed hash oil—could blow up Colorado’s legalization experiment. Darkside shatter dab, made by TC Labs for Natural Remedies in Denver. Brad Melshenker, owner of the Boulder, Colo.-based 710 Labs, knows his operation, with its extensive ventilation systems, industrial hygienist–approved extraction machine, vacuum ovens, and workers wearing respirator masks looks like something out of a marijuana version of Breaking Bad. It’s why he calls his lab manager, Wade Sanders, “Walter,” after the show’s protagonist, Walter White. And like the famously pure and powerful blue meth White cooked up on Breaking Bad, the product produced by 710 Labs’ fancy equipment is extremely concentrated, powerful, and coveted: butane-extracted hash oil (BHO). 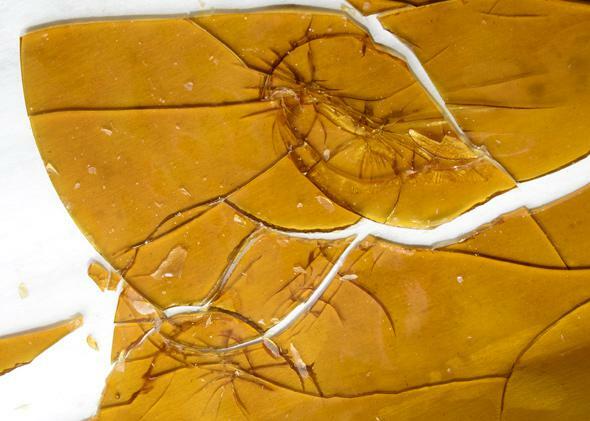 The lab’s finished BHO might not look like much—a thin, hard, and shiny brown slab, like peanut brittle without the peanuts—but when a piece of this “shatter,” as it’s called, is placed on the nail of a specially designed pipe that’s been superheated by a blowtorch, it vaporizes and delivers a direct hit of 70 to 90 percent THC, three times the potency of the strongest marijuana strains. As Melshenker puts it, if smoking regular pot is like drinking a beer, “dabbing,” as this process is known, is a shot of hard liquor. Vice calls the result, “The smoothest slow-motion smack in the face of clean, serene stonedness that you’ve ever experienced.” Rolling Stone reports, “Your head spins, your eyes get fluttery, a few beads of sweat surface on your forehead and, suddenly, you’re cosmically baked.” Some pot aficionados vow to never smoke the old way again. Gucci Earwax, a butane extraction, made by Mahatma Extreme Concentrates for Karmaceuticals in Denver. 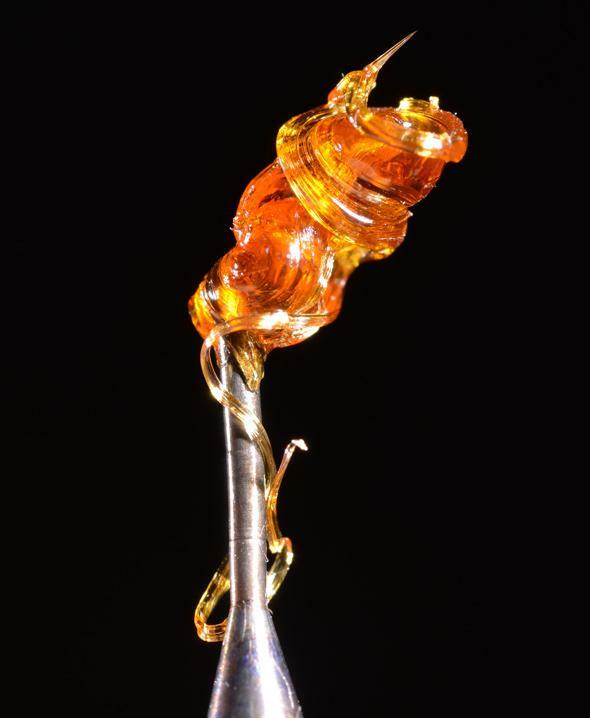 It won the first-place medical concentrate trophy at the High Times 2013 Denver U.S. Cannabis Cup. Hash oil is even fueling its own subculture. Forget 4:20; “dab heads” or “oil kids” light up at 7:10. (Turn the digits upside down and you have “OIL.”) Connoisseurs sport specially designed blowtorches and incredibly pricey “oil rig” pipes; a top-of-the-line rig from Melshenker’s Faulty Pelican glass company sets you back $14,000. There’s even dab gear, made by companies like Grassroots. “There’s a whole industry here,” says Melshenker, whose business card doubles as a stainless-steel dabber, the tool used to apply BHO to an oil rig’s superheated nail. Colorado’s thriving dabbing scene could just be one more bit of proof that the state is becoming a global mecca for marijuana. After all, the state’s legalized marijuana experiment has so far been an unqualified success. Despite the surprisingly limited number of recreational pot shops that opened their doors on Jan. 1—and the hefty crowds waiting in line to patronize them—the state hasn’t experienced widespread product shortages or weed prices high enough to trigger an Uber-style backlash. Yes, there was that story about 37 deadly marijuana overdoses on the first day of sales, but it turned out to be an obvious hoax. The few pundits who’ve complained about Colorado’s legalized pot, like David Brooks and Nancy Grace, have found their arguments blasted full of holes, not to mention lambasted on Saturday Night Live. The Justice Department is looking into ways to help banks play nice with marijuana businesses—a very serious problem—and even President Obama in a recent New Yorker profile conceded it’s important for the experiment to go forward. Soon enough, then, Colorado’s small-scale experiment should spread far and wide, with controversial drug laws getting the boot, millions of clandestine tokers coming out of the closet, and governments reaping the benefits in taxes and fees. That is unless something goes terribly wrong, derailing the whole legalization movement. Dug more graves than any other poisoned scourge that ever swept its death-dealing waves across the world. Mixed shatter slab by TC Labs. The product is broken prior to packaging to fit into the 1 gram or less packaging requirements. In Colorado, however, there have been very few sordid marijuana tales that could be used to demonize the drug—so far. Weed-fueled horror stories could still emerge in the state—and with the world watching, such calamities could have an international impact. So what are the biggest potential risks? A major concern is diversion, taking Colorado’s legal pot and offloading it to the black market or selling it out of state. While Colorado has established an extensive tracking system to prevent this from happening, there will always be tourists trying to take home a pot-infused souvenir. Beyond diversion, there’s the menace of crime—not just the threat of burglaries and organized crime in a largely cash-based industry, but also the distant possibility of banks or other financial institutions getting slapped with federal money laundering charges if they accept any of that free-flowing marijuana cash. Finally, there’s the prospective collateral damage, such as kids accidentally eating pot brownies—something that’s already in the news—or a violent pot-related car crash. If any of these calamities do occur, Colorado’s red-hot dabbing scene could in fact be the source of the problem. Dabbing certainly appears on the surface to be dangerous: Kids are freebasing marijuana! It looks like they’re smoking crack! But it’s important to remember that there’s no evidence that it’s possible to overdose on pot. (Compared to say, acetaminophen, overdoses of which killed more than 1,500 Americans during the past decade.) So you can smoke the strongest dab imaginable—or even, if you’re a showboat, smoke 50 dabs in a row—and science says it won’t kill you. It will just get you really, really high. Mars OG ISO dab, an isopropyl alcohol extraction made by Pink House Labs in Denver. But just because something won’t poison you the way alcohol can doesn’t mean it can’t lead you to do something stupid enough that will kill you. And there seem to be enough disconcerting variables associated with dabbing culture—a production process laden with volatile chemicals; a highly concentrated, easily transportable final product; and incredibly stoned kids with blowtorches—it seems only a matter of time until somebody in the scene does something very stupid and possibly fatal. Yes, dabbing might not be as inherently dangerous as, say, a bar full of binge-drinkers. But it’s important to remember that recreational marijuana isn’t necessarily replacing alcohol use—it’s just adding a new legal vice to the options people already have. While some researchers predict legalized marijuana will decrease alcohol use, others predict it could lead to “heavy drinking” and “carnage on our highways.” So will folks really reach for a dabbing pipe instead of a shot glass—or will they reach for both? Questions like this have led California and Washington to outlaw the production of smokeable marijuana concentrates. Colorado, however, has gone the opposite route: In November it released a draft of proposed concentrate production rules, positioning itself to become the only place in the world where marijuana concentrate production is both legal and regulated. The idea is to police the blooming subculture, to stay on top of it, so it ends up more akin to tattooing than meth. “If we outlaw concentrates, people will make them in their basements and blow themselves up,” says Norton Arbelaez, co-owner of the Denver dispensary RiverRock Wellness, which operates a concentrate production facility. But just because a concentrate extraction system is certified by a third-party industrial hygienist, as will likely be required by Colorado’s concentrate rules, doesn’t mean that system can’t still accidentally blow up. It makes sense that Colorado is at the vanguard of legalized dabbing. It’s made a habit of taking risks when it comes to marijuana. Colorado can’t regulate away the chance that dabbing or some other marijuana-related endeavor will lead to a spectacular accident, either industrial or personal. But so far its legalization effort has taken pains to thoughtfully minimize such risks—and so far, it’s working.